One Seaport, also known as 161 Maiden Lane, as seen from the East River. A 670-foot residential building now under construction in the South Street Seaport neighborhood is leaning precipitously north and east, according to a lawsuit filed against the developer by one of its former contractors. 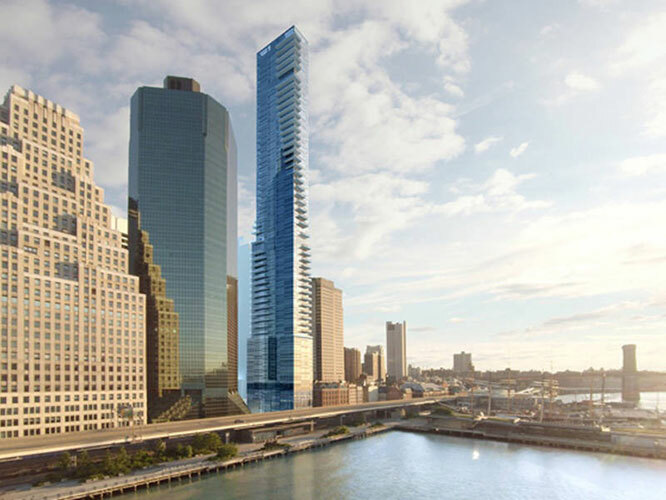 The tower, known as One Seaport, is located at 161 Maiden Lane (on the corner of South Street) and is 58 stories tall. At issue is the subterranean footing that provides foundational support to the building. Pizzarotti argues that the developer, Fortis Property Group, rejected the option of driving piles several hundred feet down into bedrock to buttress the tower. Instead, the contractor claims, Fortis chose the less-expensive method of “soil improvement” to shore up the soggy group near the East River waterfront, topped with a concrete slab. “Cost was [Fortis’s] primary consideration in electing to proceed with the soil improvement foundation method, rather than deep foundation piles driven into bedrock,” Pizzarotti alleges, while also claiming that details of this work were never shared with the contractor. 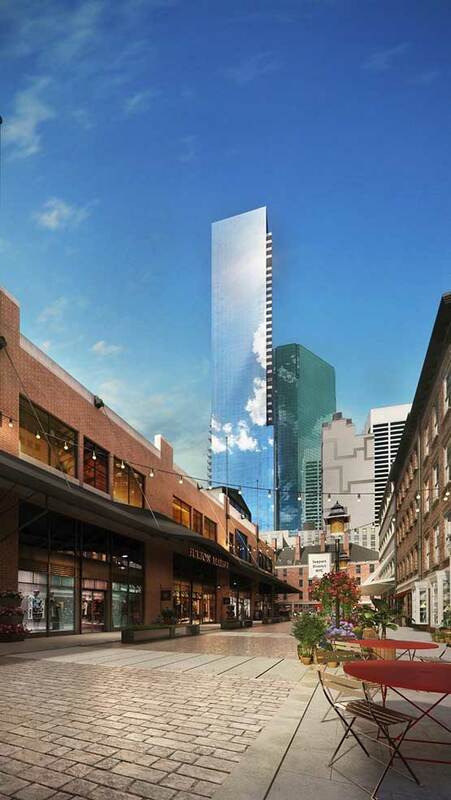 A rendering of the structure (as seen from street level in the South Street Seaport) which is alleged to be leaning precariously out of vertical alignment. This situation may serve a cautionary tale for developers and community leaders in the South Street Seaport, where multiple, large-scale development projects are currently under way, or in the planning phases. In particular, the possibility that the administration of Mayor Bill de Blasio may move ahead with a massive building project to extend the East River shoreline by as much as 300 feet could have significant implications for buildings that are not physically connected to bedrock. This arises from the fact that any change in the level of the water table, beneath the surface of the ground, can play havoc with foundation systems that rely on the firmness of the terrain.